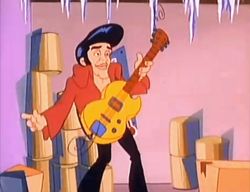 Elvin Parsley is the popular King of Sockhop Land, though he is also known as the king of rock and roll. He appears in The Super Mario Bros. Super Show! episode "Elvin Lives". Kool Koopa freezes him in a freezer and takes over, but the king is freed thanks to Mario, his friends and Elvin's magical talking shoes who speak separately by rhyming. Elvin Parsley was based and modeled off of the deceased "King of Rock" Elvis Presley, including his famous pompadour hairstyle and his younger look from the 1950's. He has a red jacket, a pompadour hair style, and is constantly twitching. He moves his hips around recklessly. This page was last edited on March 3, 2019, at 19:05.